The pomegranate is considered a sattvic fruit. This means that it promotes pious qualities such as self sufficiency, reality, consciousness, purity, creativity, and clarity of perception. It is good for the heart and has restorative properties. It promotes appetite, improves blood quality, tones the nervous system, and is useful for digestion. 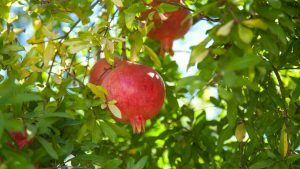 What dosha types benefit from pomegranates? Sweet pomegranates benefit all three doshas. Sour varieties are especially useful for Pitta. The taste (rasa) is sweet, sour, and astringent, the energy (virya) is warming. Sour (wild) pomegranates are chilling and drying. In Ayurvedic treatment the bark, juice, fruits, and root of the pomegranate plant are used. The latter is used as a antihelminthic agent together with clove buds. The fruit bark is used externally for burns, hemorrhoids, and ulcers, as well as an anti-inflammatory and astringent. Reduces the level of sugar in the blood and therefore can contribute to the treatment of diabetes and metabolic syndrome. Purifies the liver and ultimately gives the person a fresh appearance. It is believed that regular eating of pomegranates reduces the risk of developing breast cancer in women. Quenches thirst and regulates appetite. Activates the production of hemoglobin and therefore promotes the formation of red blood cells. Improves blood and strengthens the walls of blood vessels. As a biogenic stimulant, it contributes to the increase of mental and physical vigor and strengthens the nervous and immune systems. Has an anti-inflammatory effect, which is important for respiratory infections and fevers. Reduces edema (due to diuretic properties). Blocks the activity of free radicals. For coughing in children, try a drink made of ½ cup of pomegranate juice with a pinch of ginger and pippali. For anemia, it is recommended to drink half a cup of pomegranate juice 30 minutes before eating. For nausea and vomiting, use a mixture of ⅓ cup of pomegranate juice, one tsp. natural sugar and ½ tsp. grated fresh ginger. Take once or twice a day. If mucus appears in the feces, drink half a glass of pomegranate juice 2-3 times a day with a pinch of ground cloves and two pinches of ground ginger. Two drops of fresh pomegranate juice, dipped in each nostril, will help stop bleeding from the nose. One cup of pomegranate juice with 1 tsp. sugar and 5-10 drops of lime juice can help with rashes, hives and “hot flashes”. Take 2-3 times a day. In case of morning sickness, drink small sips of pomegranate juice with tea. For dehydration symptoms, have a drink of a cup of pomegranate juice with ½ cup of grape juice, one spoonful of sugar and a pinch of ginger. Why is pomegranate so unique? Pomegranate contains plenty of vitamins, amino and fatty acids, and minerals, such as: lysine, arginine, serine, glutamic acid, hydroxyproline, cysteine, histidine, aspartic acid, threonine, alanine, alpha-aminobutyric acid, and palmitic, linolenic, behenic, oleic, stearic acids. Vitamins: E, C, B6, B9, B3, B2, B1, traces of vitamin A, P-vitamin-like substances. Macro- and microelements: phosphorus, aluminum, chromium, calcium, manganese, magnesium, silicon, nickel, copper. Other substances: citric and malic acids, flavonoids, tannins. children who are less than 1 year old. 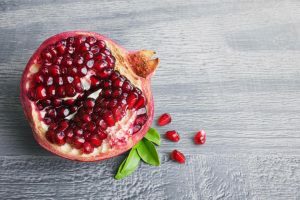 Pomegranate juice can be detrimental to the state of tooth enamel due to its acidic property, which is why dentists recommend brushing your teeth immediately after consuming a pomegranate. Care should be taken when using pomegranate skin for medicinal purposes, since it contains up to 0.5% of toxic alkaloids. Before starting any therapy, it is essential to consult a doctor. The skin of the pomegranate is very useful, due to the mineral substances contained in it, including: calcium, iron, copper, molybdenum, aluminum, nickel, boron, potassium, magnesium, manganese, zinc, chromium, selenium, and strontium. To extract them we can use them in broths, tinctures, and powders. The white membranes of the pomegranate fruits can be dried and added to teas to strengthen the nervous system, and get rid of stress and anxiety.